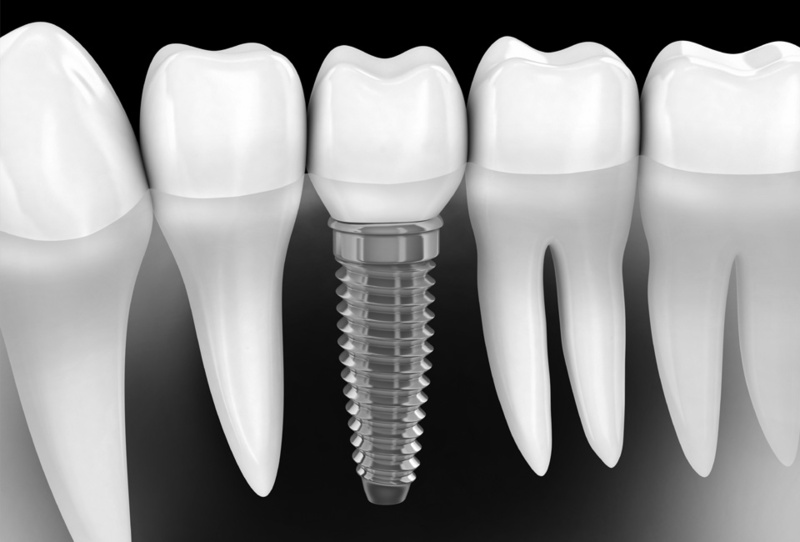 A dental implant is a biocompatible titanium screw which is placed into the jawbone to act as a root. It supports either a crown or bridgework in much the same way as a tooth does. Or, can support a full arch of teeth in certain situations. Implants are the treatment of choice for restoring spaces, as they do not rely on the adjacent teeth. They are a well-established treatment option and with regular maintenance and aftercare can last very many years. After assessing the suitability of the patient for treatment, and the jawbone, a comprehensive treatment plan is discussed. This will be carried out by your dentist, and perhaps you will have a special 3D scan of the bone (CT scan). This assessment may include a discussion involving perhaps a sinus lift or bone grafting if there is insufficient bone of good quality. An implant is placed into the bone under local anaesthetic, in a sterile surgery environment, by our specialist implantologist. This is allowed to heal and the final crown will be constructed by your dentist 3-6months after the placement.